We will begin to accept and review new student applications beginning on January 18, 2019, following our Open House. 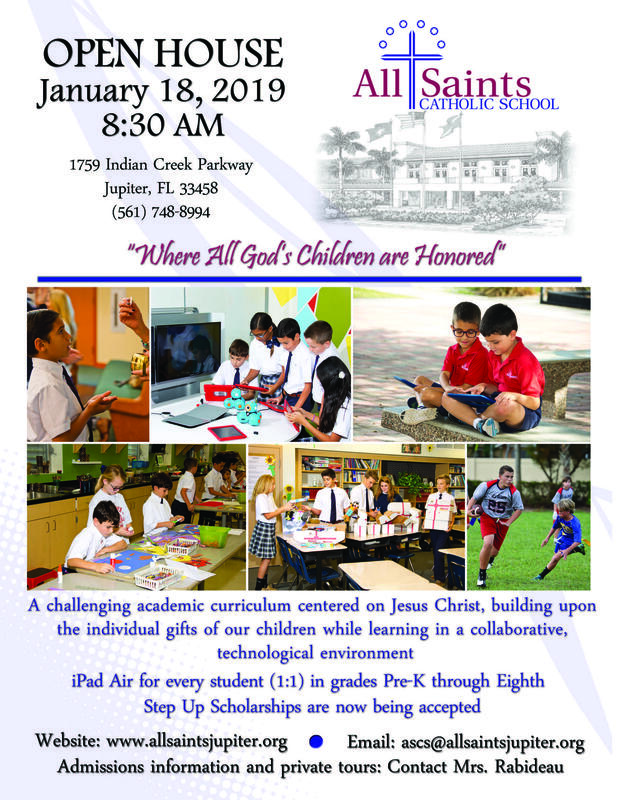 If you are interested in All Saints Catholic School and would like to submit an application for your child, you will find the admission packet below Please complete the application and submit to the school office with the $100 application fee (per applicant) and other required documents. Please use the checklist provided in the packet as a reference for documents needed. For the 2019-2020 school year, ASCS will continue to offer a part time PreK4 from 8 am - noon as well as their all day PreK4 from 8 am - 2:15 pm. If you have questions concerning admissions or the application process, please contact Patty Rabideau, Admissions Director, at (561) 748-8994 ext 108 or by email.